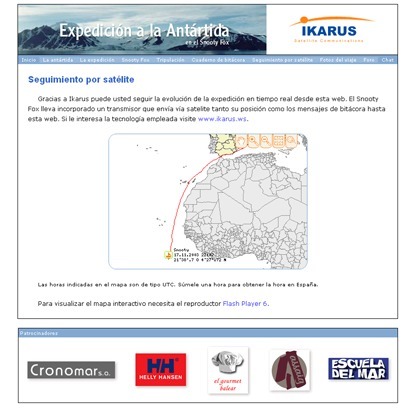 The idea behind the Ikarus project was to create a web platform to control satellite communicators in different ways. 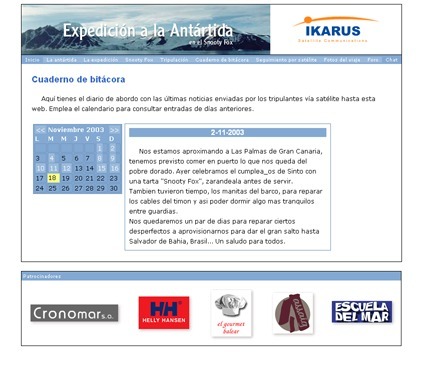 Together with my cousin Carlos we created the first version of this web platform in 2001. The plan was to be able to see in an interactive map where your truck, boat or airplane was at the moment, where it had been in the past, read variables sent from the devices (for example pressure, temperature), and be able to send and receive messages from those devices. The hardware used the Orbcomm satellite network and the whole concept was created by my friend Miquel. The main parts of my work were creating a back end, a front end (both using PHP and MySQL), and a Flash based MapServer interface component. This 15 Kb component was quite innovative at the time. Normal use of MapServer required clicking arrows which would reload the whole page (at a time where people still used modems). I created a map interface that could be simply dragged around, the same way Google Maps did it 3 years later. It took more than 5 years for similar web map interfaces to become popular. MapServer was able to generate images in different formats. I realized that if I used PNG images the file sizes were really small, less than 2 kb most of the time. But Flash was not able to load PNG images so I did a PHP script that would do server side PNG to SWF file conversion on the fly. It worked really nicely. The project did never really take off. It was hard to sell this idea in Mallorca, where we lived at the time. To prove how useful it could be Miquel designed a floating transmitter and offered it for free to track the oil spill in north Spain in 2002. Unfortunately no one seemed to know who was taking the decisions during this crisis, and the help was never accepted. 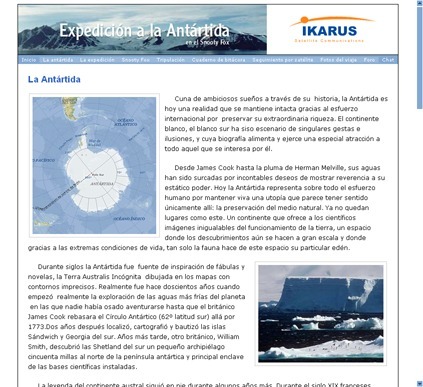 In 2003 our system was tested in a boat expedition from Mallorca to the Antartic. We created a simple web page for this project, which would receive coordinates, texts and photos from the boat, and present them as a blog. At the time I was quite proud of using CSS. I think it was probably the first time I developed and styled the whole web site using style sheets. It made it so easy to update!